It wasn’t the first werewolf movie ever made, but it was the first to become a blockbuster. One of Universal’s classic monster films, The Wolf Man paved the way for an entire genre, ushering in such lupine favorites as 1981's duo of The Howling and John Landis’s An American Werewolf in London. Here are some hair-raising facts about the transformative masterpiece. 1. THE WORKING TITLE WAS DESTINY. Riding high on the success of Bela Lugosi’s Dracula (1931), Boris Karloff’s Frankenstein (1931), and Claude Rains’s The Invisible Man (1933), Universal Studios gave audiences a fresh look at another famous monster in 1935. That year, they released Werewolf of London, starring Broadway crowd-pleaser Henry Hull. Unlike many of the studio's previous horror flicks, this lupine picture tanked at the box office. Still, six years later, Universal was ready to give the lycanthrope genre one more try. Novelist and screenwriter Curt Siodmak was tapped to pen a new script. In just seven weeks’ time, Siodmak put together a thrilling story about an American named Lawrence Talbot who travels to his family’s ancestral home in Wales, where he’s bitten by a werewolf. Originally, the movie was titled Destiny, but this was changed to The Wolf Man by the time it premiered. 2. REAL-LIFE ATROCITIES HELPED CURT SIODMAK EMPATHIZE WITH THE MONSTER. Lawrence Talbot’s struggle in The Wolf Man was influenced by Siodmak’s own experiences. A Jewish man of Polish descent, the writer was born in Dresden, Germany on August 10, 1902. Even as a boy, Siodmak’s literary talents were readily apparent: At age nine, his first short story was published in a children’s magazine. Bowing to his father’s wishes, the young man went on to earn degrees in engineering and mathematics, but writing always remained his true passion. By the late 1920s, he’d found work as a journalist and emerged as one of Berlin’s most prominent authors. Siodmak also made a name for himself within the German film industry—until Hitler’s Third Reich came to power. The spread of Nazism drove him to France and then to the UK. Finally, in 1937, Siodmak left Europe altogether. 3. BELA LUGOSI WANTED TO PLAY THE MAIN CHARACTER. Lugosi lost the role to Lon Chaney Jr, whose performance in The Wolf Man propelled him into stardom. Nevertheless, the former Count Dracula didn’t get left out. Universal cast Lugosi as a mustachioed Gypsy fortuneteller named “Bela.” This character is later revealed to be a werewolf who gets the plot rolling by biting our friend, Mr. Talbot. 4. THAT SUPPOSEDLY ANCIENT POEM WAS MADE UP BY SIODMAK. “Even a man who is pure at heart and says his prayers by night may become a wolf when the wolfsbane blooms and the autumn moon is bright.” Over the course of the film, this spooky verse is recited on several occasions—usually by a character who claims that it’s some sort of ancient rhyme. But the poem was really authored by Siodmak himself. In 1989, he told journalist Tom Weaver “nowadays, film historians think it’s from German folklore. It isn’t. I made it up.” Authentic or not, the poem was repeated verbatim in 2004’s Van Helsing. 5. THERE WAS SOME TENSION BETWEEN THE TWO LEADS. Nicknamed “Queen of the B’s,” Evelyn Ankers appeared in numerous horror films, usually as some love interest or damsel in distress. In The Wolf Man, she plays Gwen Conliffe, a storeowner’s daughter who falls for Talbot. Although their characters had great chemistry, Chaney and Ankers didn’t always get along behind the scenes. Trouble started brewing when the actress was given Chaney’s dressing room. To get even, he subjected Ankers to numerous pranks—none of which she found all that funny. On many occasions, the six-foot, 220-pound Chaney snuck up behind her in full werewolf makeup. Once she turned around, he would seize her shoulders and growl. “He had to hold me, or I would have ended up in the rafters!” Ankers later said. 6. ANOTHER PROBLEM? A DANGEROUS FOG MACHINE. Billowing, man-made fog greatly enhanced the movie’s climax. It also turned into a real safety hazard. Toward the end of The Wolf Man, Gwen rushes through a murky forest to escape Talbot’s lupine form. Just after he grabs her, Talbot is attacked by his own father, Sir John (played by Claude Rains). As they fight, Gwen faints, disappearing beneath a thick blanket of fog. Director George Waggner had instructed Ankers to lie still until somebody screamed “Cut!” However, things didn’t go according to plan. After Ankers fell, she never heard anyone shout the agreed-upon safety word. “They started to prepare for Lon to finish the fight scene with Claude Rains. Well, they forgot me in all the hustle and bustle,” she later explained. While she waited, Ankers inhaled a copious amount of noxious fumes from the fog machine. Before long, she passed out. “Fortunately, someone in the crew nearly tripped over me and I was saved,” Ankers recalled. 7. THE MONSTER’S DESIGN WAS RECYCLED FROM A DIFFERENT MOVIE. The creature’s appearance was the brainchild of makeup artist Jack Pierce. An unbelievable talent, Pierce is best remembered for creating the signature look of another classic movie monster in Universal’s Frankenstein. In 1935, he’d lent his expertise to Werewolf of London. 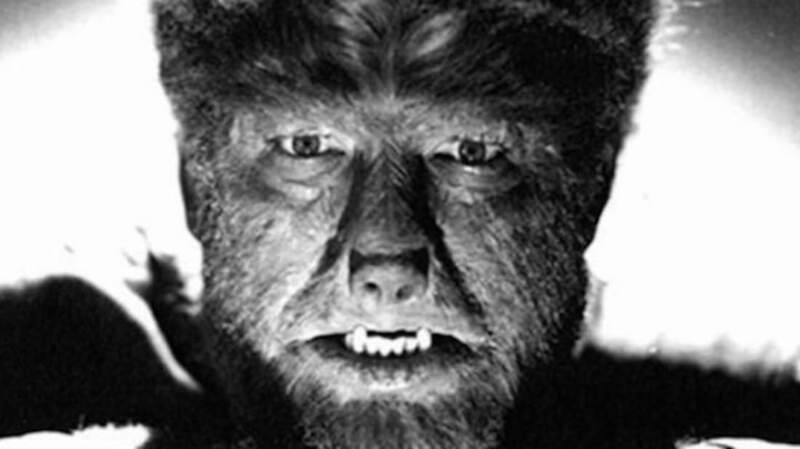 For that film, Pierce created the very lycanthrope facial design that would later be used in The Wolf Man. However, he had to go back to the drawing board when Howard Hull refused to wear it. Apparently, the Broadway star complained that he wouldn’t be recognized under the thick coat of hair. A less extreme design was ultimately used instead. Lon Chaney Jr. didn’t share Hull’s reservations. Once The Wolf Man came along, Pierce recreated the makeup style that had been cast aside six years earlier. 8. CHANEY’S WOLF GETUP TOOK HOURS TO PUT ON. Removing this material was even more wearisome. “What gets me,” Chaney vented, “is after work when I’m all hot and itchy and tired… [I’ve still] got to sit in that chair for forty-five minutes while Pierce just about kills me, ripping off all the stuff he put on me in the morning.” In Frankenstein, Boris Karloff took to sleeping with his makeup on in order to skip the next day’s application ritual. Chaney considered following suit, but worried that his eyelids might get stuck together while he dozed. 9. A LIVE BEAR ONCE RAMPAGED THROUGH THE SET. In one deleted scene, Talbot wrestles a 600-pound ursine. The sequence was shot on a sound stage, wherein the bear spent most of its time chained to a pole. At one point, it broke free—and immediately charged towards Ankers! “I never ran so fast in all my life,” she said in retrospect. Fueled by adrenaline, Ankers bolted up a ladder and into the studio rafters. An electrician who happened to be up there hauled her onto a platform. Down below, the bear was eventually brought under control by its trainer. 10. CHANEY’S BELOVED DOG MAKES A CAMEO APPEARANCE. When Bela bites Talbot, he does so in canine form. For that scene, Waggner recruited a German shepherd named “Moose.” As it happens, Moose was Chaney’s pet. By all accounts, the two were inseparable and the Wolf Man star could often be seen walking the canine around the Universal lots. Tragically, Moose was killed by a car in 1944. 11. THE MOVIE’S RELEASE DATE WAS MET WITH SOME CONTROVERSY. From the get-go, Universal had planned to release The Wolf Man in December, 1941. However, the December 7 attack on Pearl Harbor made the studio think twice about the premiere date. With the attack still casting a shadow over the American public, Universal worried that audiences wouldn’t find The Wolf Man—or any other monster picture—the least bit frightening. The country had just been propelled into World War II, so why would anybody be afraid of a big, bad wolf? Nonetheless, Universal stuck to its schedule. The Wolf Man was previewed in Hollywood on December 9 and opened nationwide three days later. Some critics felt that, given recent events, the studio’s decision to unveil a new creature feature was in poor taste. To cite but one example, Variety’s review of The Wolf Man called it “dubious entertainment at this time.” And yet, against all expectations, the movie turned into a monster hit, grossing a then-spectacular $1 million domestically. 12. THE WOLF MAN WAS CHANEY’S ALL-TIME FAVORITE ROLE. The film’s success secured Chaney’s place alongside Lugosi, Karloff, and Rains on the Mount Rushmore of horror icons. Over the next few years, he’d more or less become Universal’s go-to guy whenever a new monster role became available. Between 1941 and 1949, the rising star played a mummy, the vampiric son of Dracula, and Frankenstein’s monster. Still, the role of the Wolf Man always held a special place in his heart. Later in life, Chaney wrote “Of all the character’s I’ve been, I liked Lawrence Talbot, the Wolf Man, the best.” Like Siodmak, Chaney regarded him as a tragic figure. “He never wanted to hurt anyone,” noted the actor. “During his period of sanity, in between full moons, he begged to be confined, chained, even killed to avoid the horrible consequences of his curse. He was a classic product of misunderstanding."